Tweet: Pay tribute to the industrious Queen bee, buzzy away creating sweet glistening, golden honey. My final review for the new PANDORA Shine range from the Spring 2018 is a double review of the majestic PANDORA Shine Queen Bee Pendant and delectable PANDORA Shine Golden Honey Charm. For many fans, the PANDORA Shine Queen Bee Pendant (367075EN16) was the highlight of the PANDORA Spring Collection and it has received a lot of attention. It was a definite must have for me and I’m excited to share my opinions and stylings. I decided to write a joint review with the glowing PANDORA Shine Golden Honey Charm (767120EN158) as I will be mostly wearing them together. 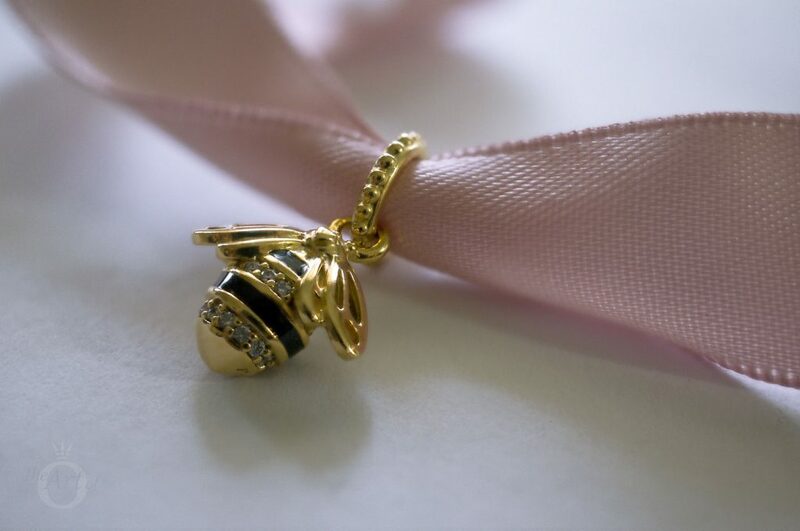 The Queen Bee Charm is quite a delicate pendant and is a lot smaller than the PANDORA Shine Sweet As Honey Pendant Charm. The bale is a slender ring with pretty beaded detail that looks splendid in the 18k gold plating. The cute bumble bee stripes on the Queen Bee Pendant are adorned with alternate rows of clear cubic zirconia stones and glossy black enamel lines. I am not always a big fan of cubic zirconia but the use of them in this charm is fitting. 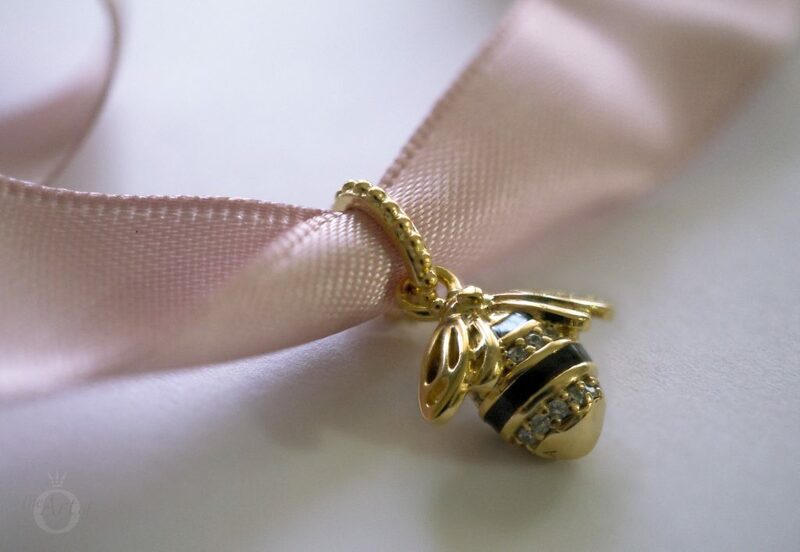 The PANDORA logo is engraved at the bottom on the reverse of the Queen Bee Pendant which is a pretty little detail. 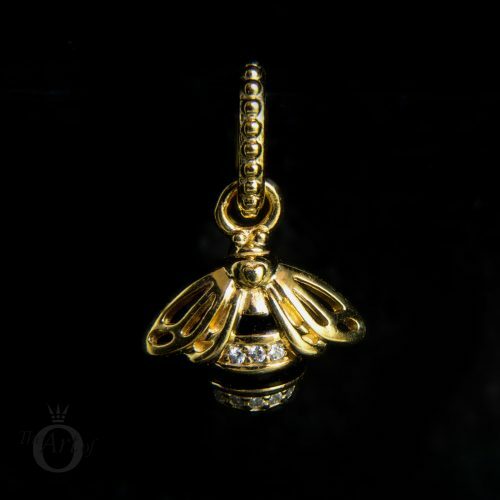 It took me a while to locate the standard ‘S925 ALE’ PANDORA hallmark on the Queen Bee Pendant! It is really is hidden very well on the inside on the bale ring. 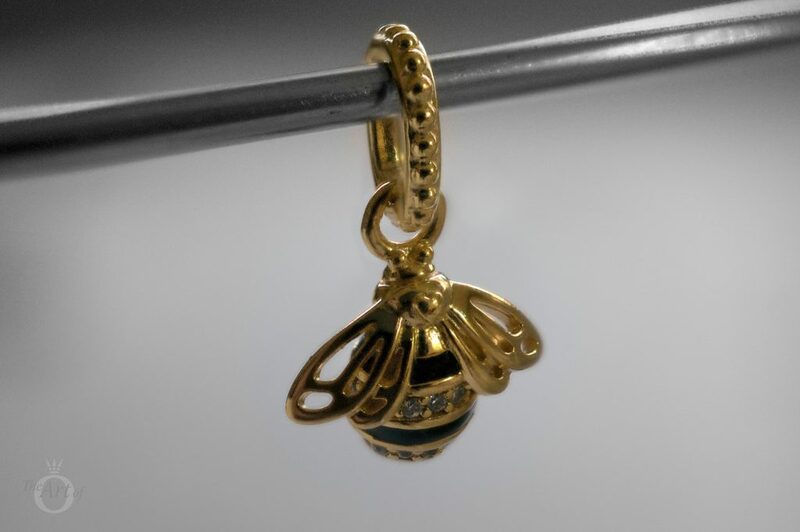 PANDORA have designed the Queen Bee Pendant very accurately, especially the wings. Honey bees have two sets of wings which are attached to the thorax and the fore wings are much larger than the hind wings. On the pendant the fore wings have a wonderful cut out detail that is charming! Miniature hearts appear to be a constant feature on PANDORA’s recent charms. 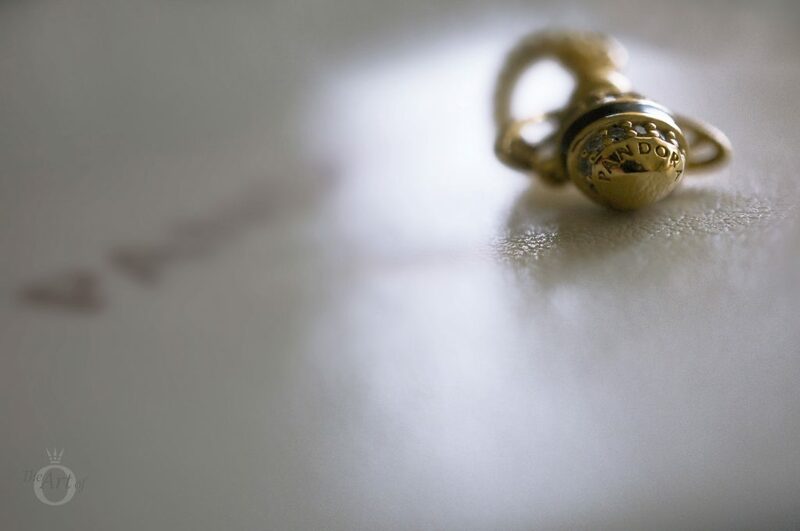 The tiny love heart that sits on the centre of the Queen Bee is a delightful detail and completes the charm perfectly. 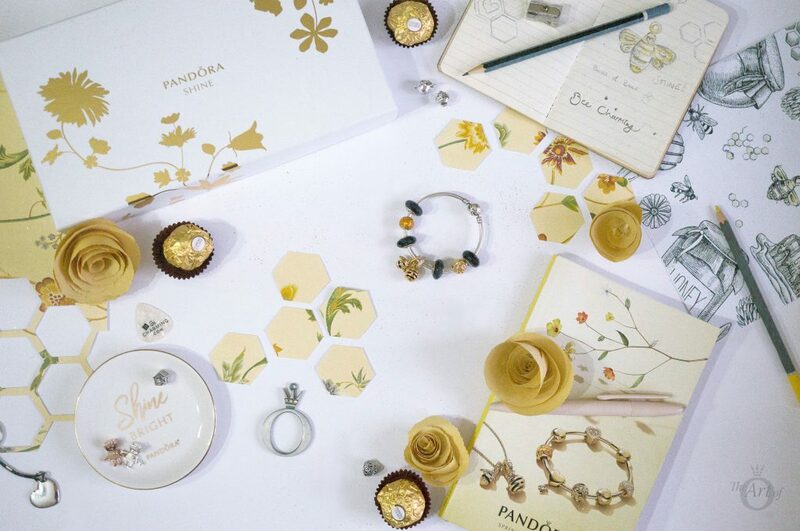 The PANDORA Shine Golden Honey is mouth watering gorgeous with its dripping gold running over the sides of the charm. 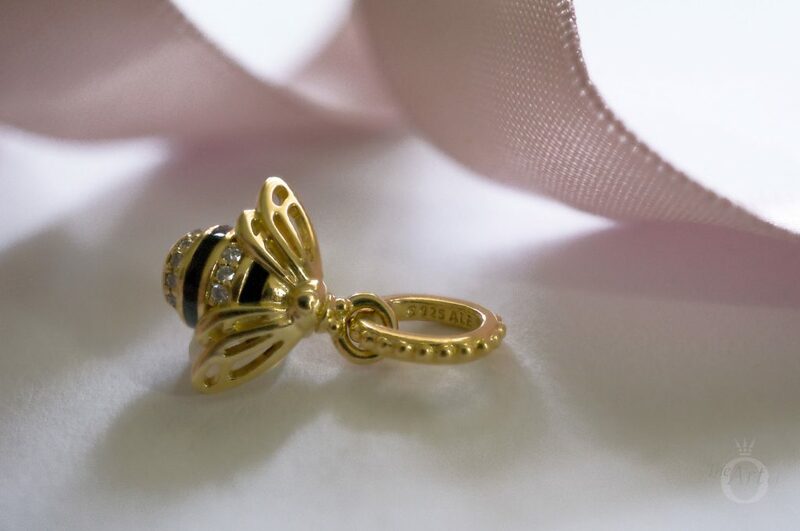 The 18k gold plating is ideal for a honey and bee theme and I cannot imagine this charm looking as beautiful in silver. 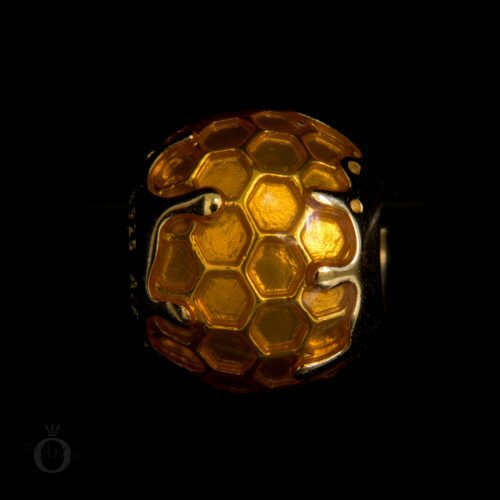 The overall design of the Golden Honey Charm is quite simple but the multilayer effect of the honeycomb, golden yellow enamel and gold is incredibly effective. The end result is quite hypnotic! The beauty of the charm is in the contrast of the glossy, smooth surface compared to the sculpted honeycomb pattern beneath the enamel. The normal PANDORA hallmark ‘S925 ALE’ is tucked to one side of the charm. 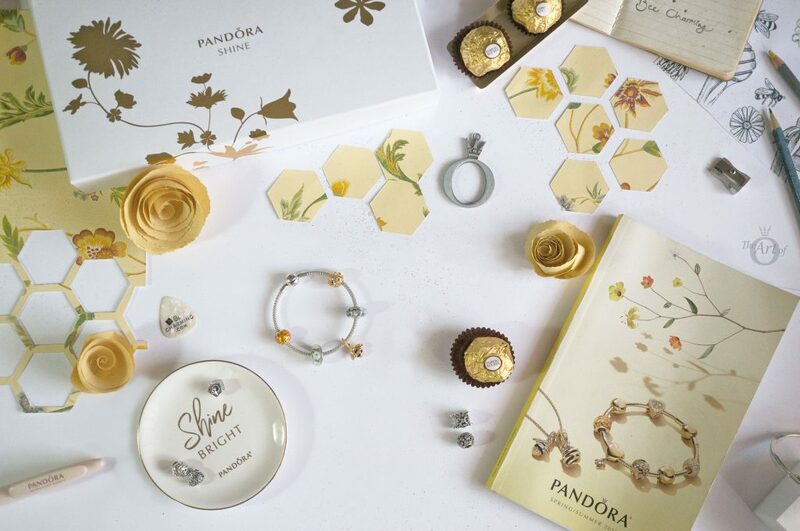 As the PANDORA Shine range is 18k gold plated and not solid gold it has the standard PANDORA silver hallmark. As with the PANDORA Rose range, the PANDORA Shine charms are not threaded. I believe this is so as to protect the gold plating from being damaged. 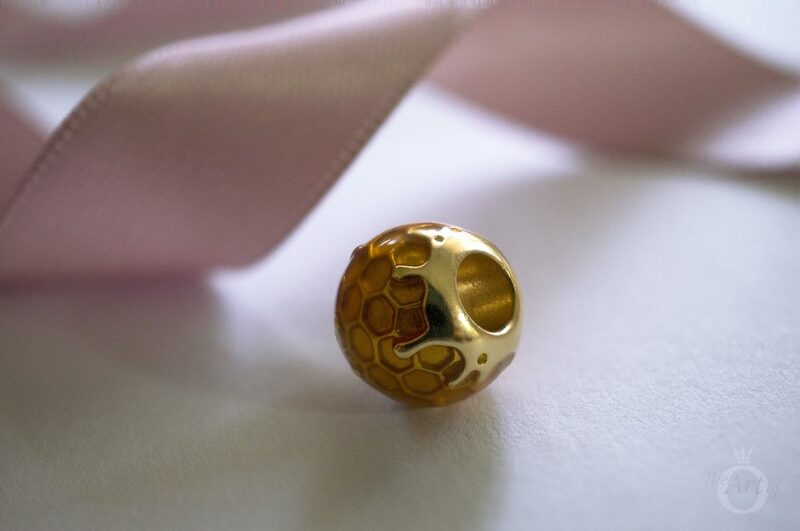 Despite not being a threaded charm, the Golden Honey Charm has a very solid and weighty feel. 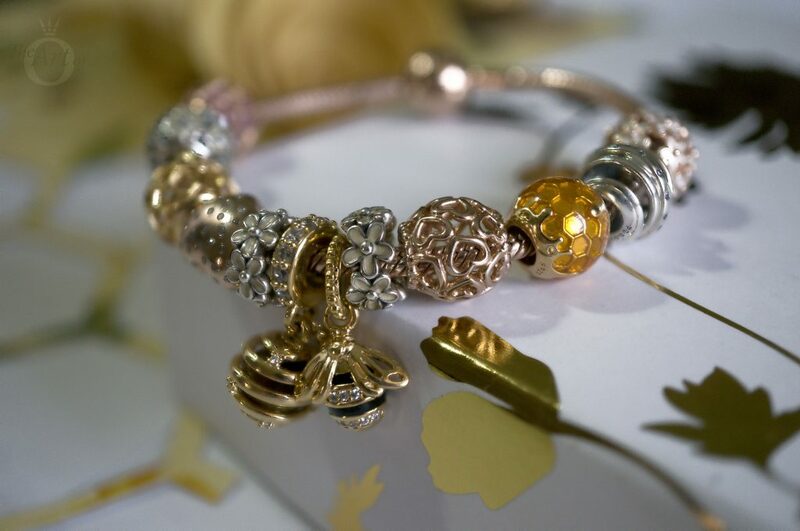 My first styling of the PANDORA Shine Queen Bee Pendant and Golden Honey Charm also includes another PANDORA Shine Charm the adorable Honeybee Charm (767023EN16). This glistening, golden trio is paired with the new PANDORA Moments Silver Sliding Bracelet (597125CZ) to create a glamorous day style, hence the title ‘Gather Honey All Day’! The Sliding Bracelet has a fresh, modern feel and is ideal to wear as a daily bracelet and it’s so quick to style! A more comprehensive review discussing the benefits and features of the PANDORA Sliding Bracelet will be out soon so stay tuned! In my second styling, ‘The Hummer of Summer’, I used the same three PANDORA Shine Charms on the marvellous Mesh Bracelet (596543) which is wonderful for the warmer months as it is lightweight and comfortable. Interspersing the PANDORA Shine Charms are the whimsical Wildflower Murano (791638CZ) and the new Enchanted Garden Murano Charm (797014). 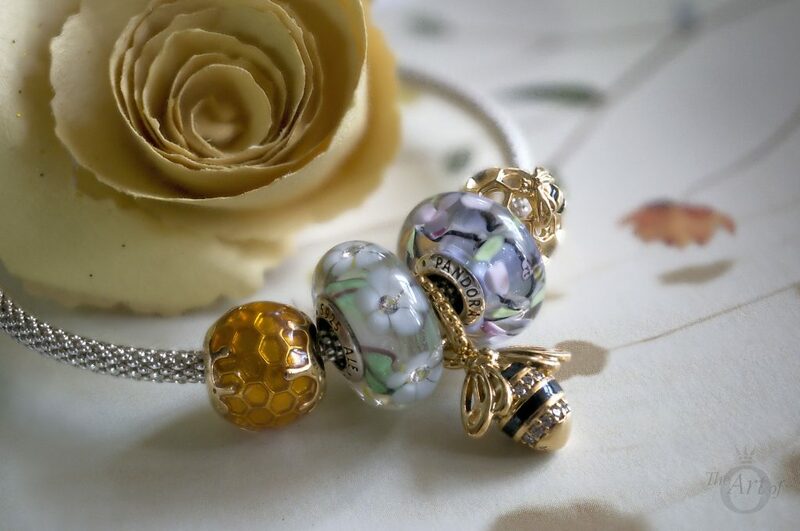 The pale spring green glass in the Murano charms looks delightful with the gold Shine Charms and the soft lilac in the Enchanted Garden Murano creates balance with the warmth of the Golden Honey Charm. I was pleasantly surprised in my previous PANDORA Shine review to discover how beautiful the Shine charms look against the Smooth PANDORA Rose Bracelet (580728). In this ‘Dance of the Bees’ styling I used a mishmash of PANDORA Shine, PANDORA Rose and silver PANDORA charms with a love and floral theme. The Queen Bee Pendant sits centre stage alongside the PANDORA Shine Sweet As Honey Pendant Charm (767044CZ). This is the first time I have created a design with two pendant charms side by side and normally I don’t think it would work but in this case as the Queen Bee Pendant is slightly smaller it looks appropriate. It also aptly illustrates a bumble dancing around a honey hive. My final design is based on the stripes of a bee and alternates the amazing Fascinating Adventurescent Stardust Murano Charms (791628) with my four PANDORA Shine charms on the retired Dainty Bow Bangle (590724cz). The gold plating from the PANDORA Shine charms emphasises the shimmering copper flecks inside the Stardust Murano Charms. These wonderful Murano Charms are discontinued and if you ever come across them in your PANDORA shopping travels, I fully recommend you purchase a couple. 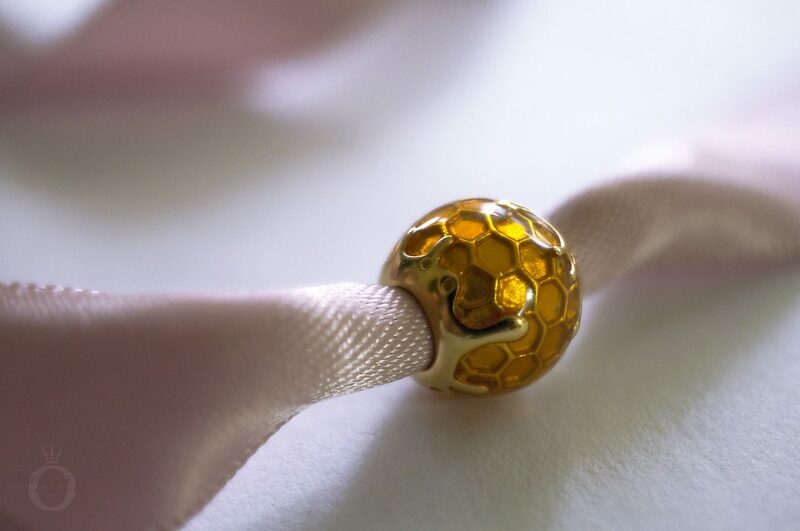 My verdict on the PANDORA Shine Queen Bee and Golden Honey Charms? They are as sweet as can bee! 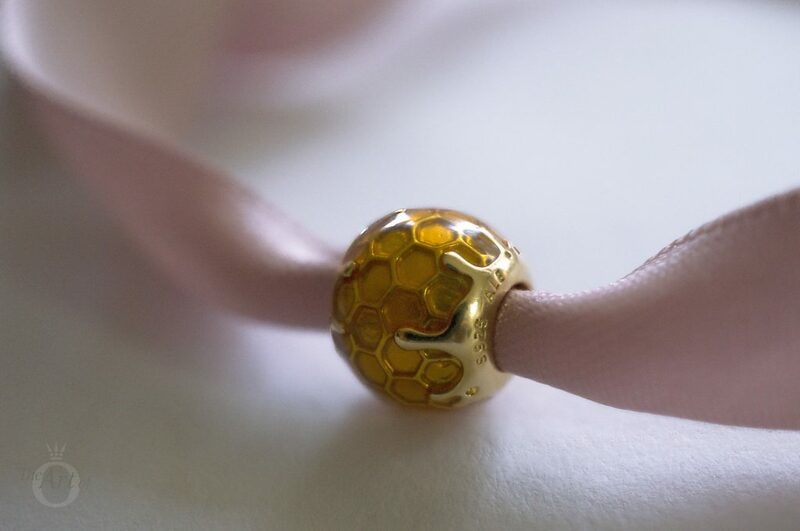 This charm very much fits into the Shine Honeybee theme, and if you are building a bracelet to that theme this is a lovely addition. It might not be your centerpiece but it has an unusual and original design and does not focus too much on the Shine gold but has a lovely enamel glaze. In the UK the PANDORA Shine Queen Bee Pendant Charm (367075EN16) is £70 and the PANDORA Shine Golden Honey Charm (767120EN158) is £55. Both are available from the PANDORA UK eStore. 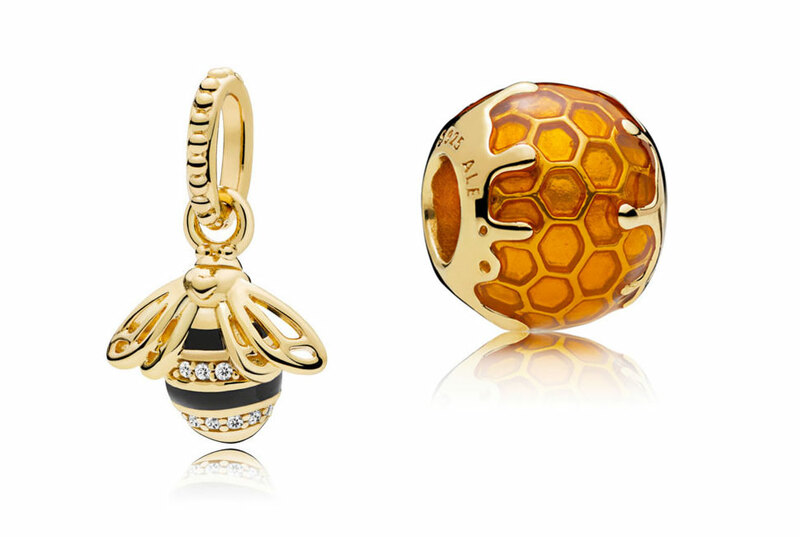 the honey bee charm as well as the golden honey charm are both beautiful pieces. I love how u have styled yhem both. 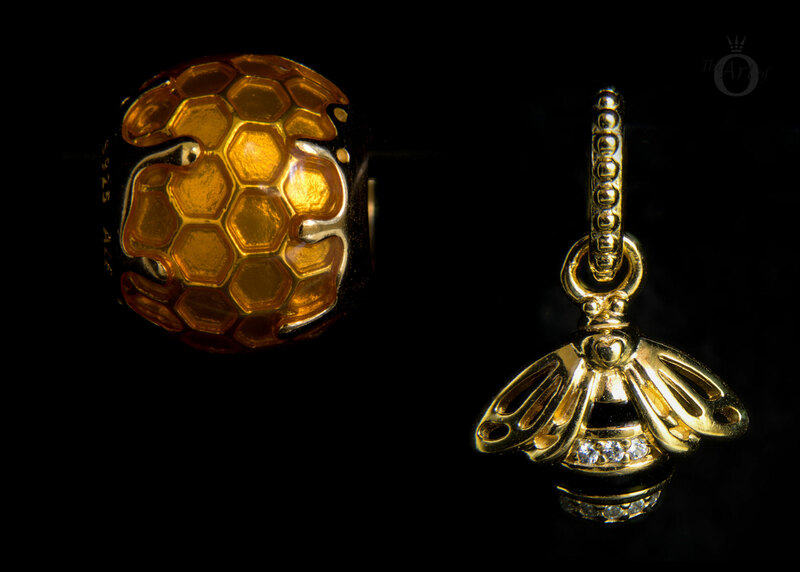 The honey bee pendant looks lovely with the floral design bracelet. I really like the floral design too. I love that the Enchanted Garden Murano also has a tiny bee inside the design as it really makes it seem like lots of bees are humming around the garden flowers. I’m still hoping that the PANDORA Shine range will arrive in Fiji soon! Sorry, we had a problem with comments turned off for a while there. Never had that before! Sorry for the inconvenience. 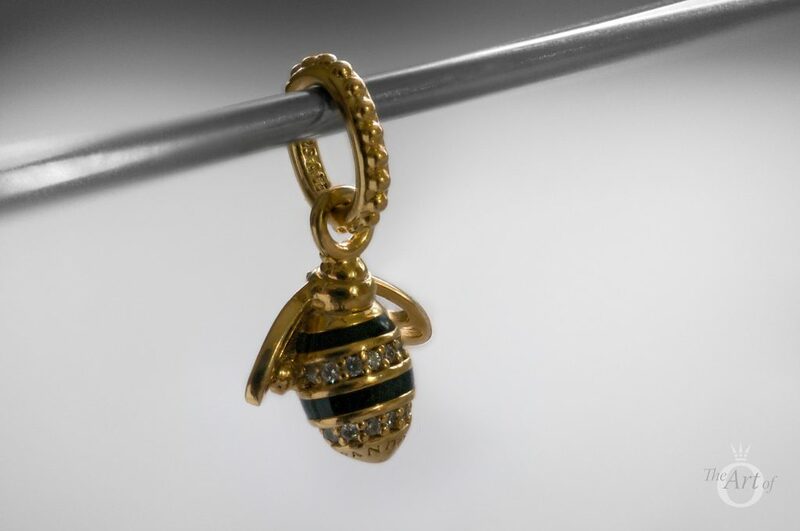 I love this Queen Bee Charm it is my favourite from the Shine range so far. bees are lovely and I really want to get this one. Aww thank you so much for your lovely comment! 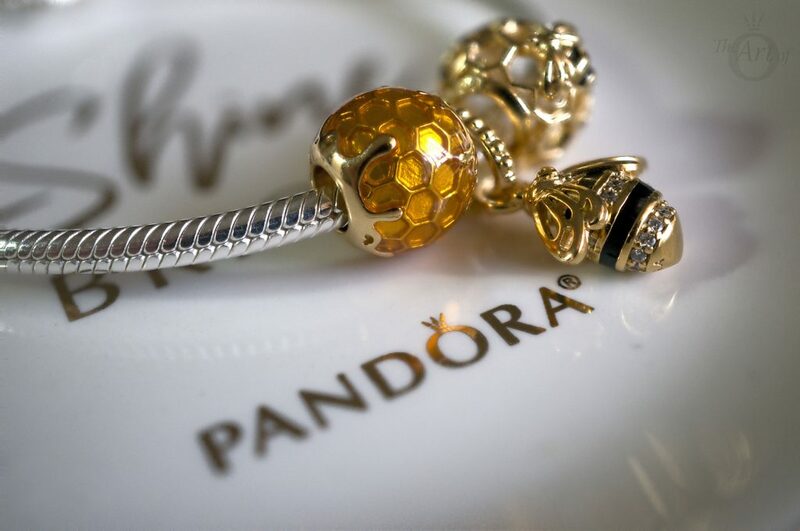 The Queen Bee pendant definitely seems to be a favourite for many PANDORA fans. It is very pretty! 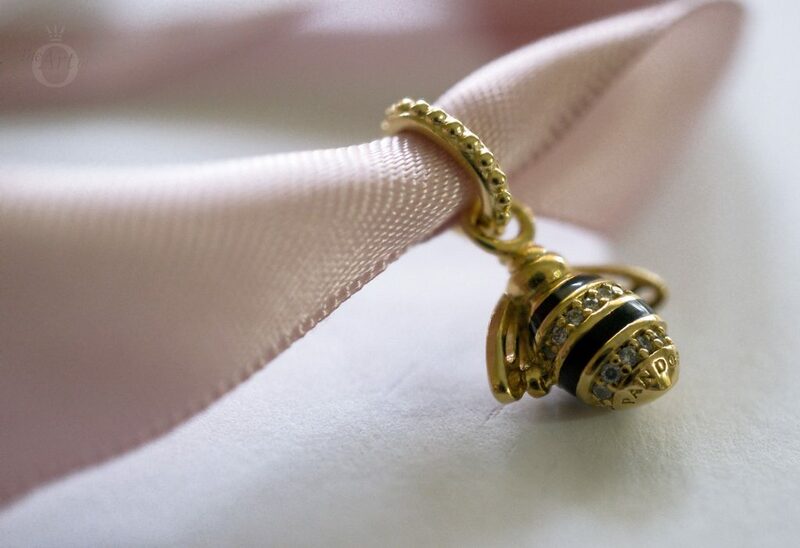 I also really like the tiny PANDORA Shine Petite Bee for the Floating Locket. I think I will get it if I decide to purchase the Floating Locket Bangle! What a lovely review! Thank you so much for sharing. Will you be reviewing any other items from the Spring 2018 Collection? I see you included Enchanted Garden Murano in this review. That is definitely one that I have my eye on. 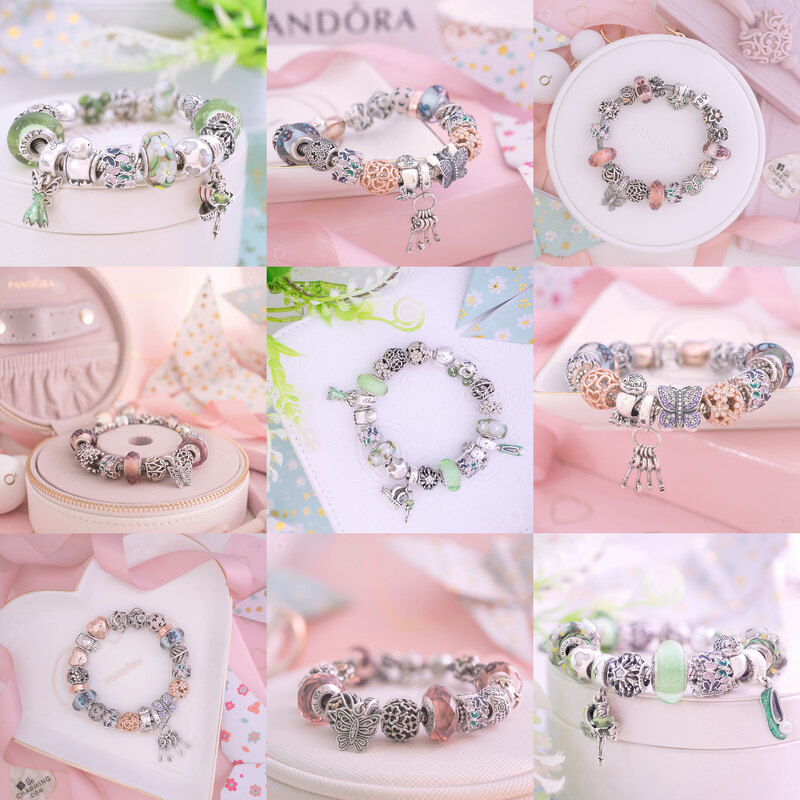 I do have quite a few PANDORA reviews coming soon and yes the PANDORA Enchanted Garden Murano will be one of them! The next review will be the PANDORA Rose and silver Bella Bot charm which will be out later today, so check back soon! I really enjoyed this review, and like the new summary and scoring system at the end. I love the hummer of summer design. Those two muranos are what I plan on getting for my floral tea party bracelet. I’m really pleased with the new scoring system and I’m happy you like it! The Hummer of Summer is my favourite design too and the Wildflowers and Enchanted Garden Murano charms are so pretty. Do you already have the Wildflowers Murano? It has been retired and is a bit harder to locate now. It was in the UK PANDORA sale but has sold out. It might still be in the available in certain stores in the US though. Will you have the new Enchanted Tea Pot on your floral tea party bracelet? I absolutely love the little summary charts you have! Such a wonderful way to end the review! The way you arrange the bee makes it look even more stunning 🐝. I love the details on him… The wings are little works of art. I agree the cz detail it perfect for this charm! Ah thank you! I’m really pleased with how the new review summary is working out and it’s nice to be able to break down the different aspects of a charm. The Queen Bee really is wonderful! The first PANDORA Shine range was incredible and I am excited about future designs and releases. I am still not sure to dip my toes into Shine yet, I will wait for updates on how it wares. This review is lovely though as I am very tempted by the Queen Bee Charm. It is such a beauty. I am loving the new summary section too Dora! It makes a nice end to the review and as you mentioned in the newsletter it is a bit more specific that a 5 stars verdict every time. I will keep you updated on how the PANDORA Shine jewellery gets on… so far so good! I’m pleased you have enjoyed the Shine reviews and I hope you will like the next ones from the Spring Collection too. The PANDORA Rose and silver Bella Bot charms are next! I own 3 of the bees and love them! I turn one wing to the back. So adorable. I did not want the golden honey but might later. Wow! 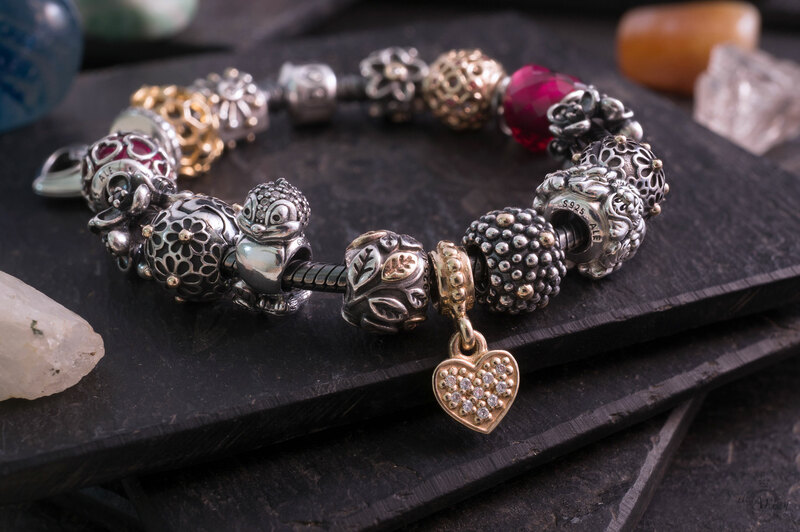 How do you style your 3 Queen Bee charms? Do you spread them out over a bracelet? I would love to see a photo! The Golden Honey charms looks so sticky sweet and tasty that I had to have it. I like to pair it with my Pooh charm too as he loves his honey! Absolutely stunning designs and lovely reviews of the Shine charms. My favourite stylings are the second one with the floral muranos and the fourth one with the stardust muranos. Thank you for your sweet comment! The floral design is my favourite too. 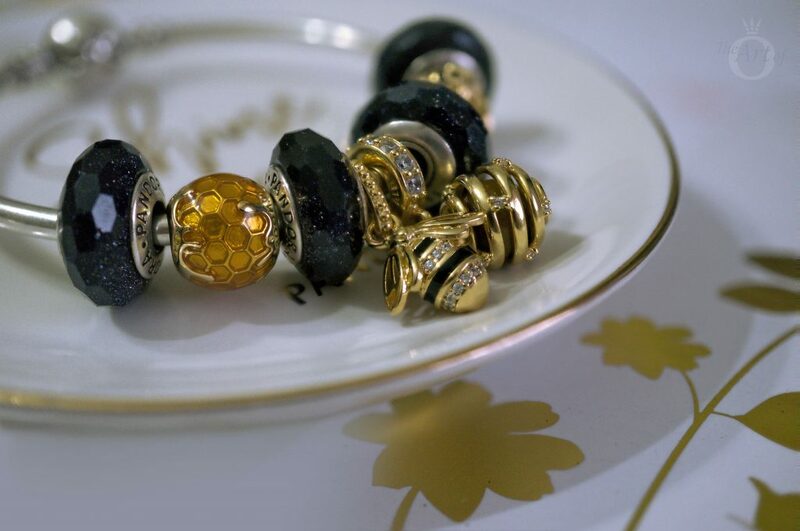 I hope that PANDORA release a black PANDORA Shine Murano as I think that would look amazing too! I still need to get some of the White Waves Murano charms too. My next review is the two versions of the Bella Bot charm – I hope you will enjoy it! Thank you for the review. Thank you for the lovely review and the very nice blog that you are running. 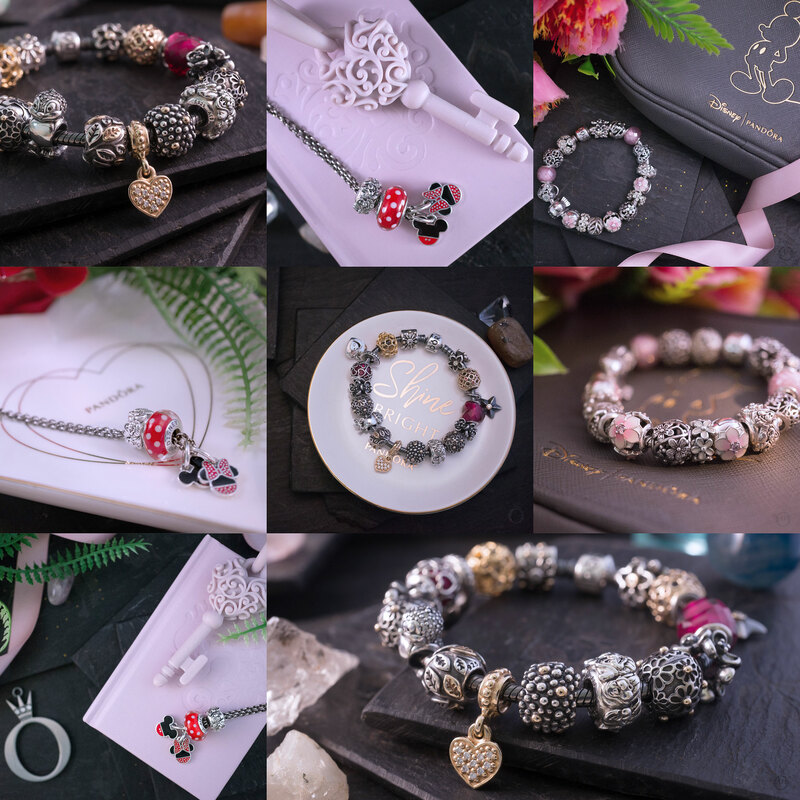 I am new to the world of Pandora, having just been given a gift of a bracelet and selection of charms. So I am fascinated to come across your blog and all this information today. I will have to read more of these reviews, it looks to me that pandora could be quite the addiction. I shall have to be very careful. Also, your pictures are beautiful. Lovely photos and review. 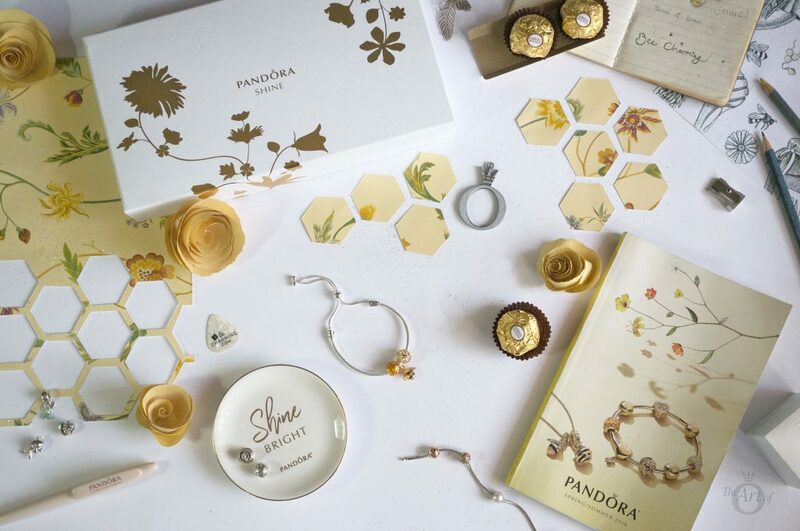 I hove the Pandora Shine collection and need to save some pennies to try and get some of them, Do they do a shine bracelet as well? Thank you so much for your kind words. The PANDORA Shine is a lot more affordable than the solid 14k gold PANDORA jewellery and incredibly beautiful. There are quite a few PANDORA Shine bracelets; the PANDORA Shine Sliding Bracelet, the Smooth PANDORA Shine Bracelet and the PANDORA Moments Bangle with a PANDORA Shine clasp. 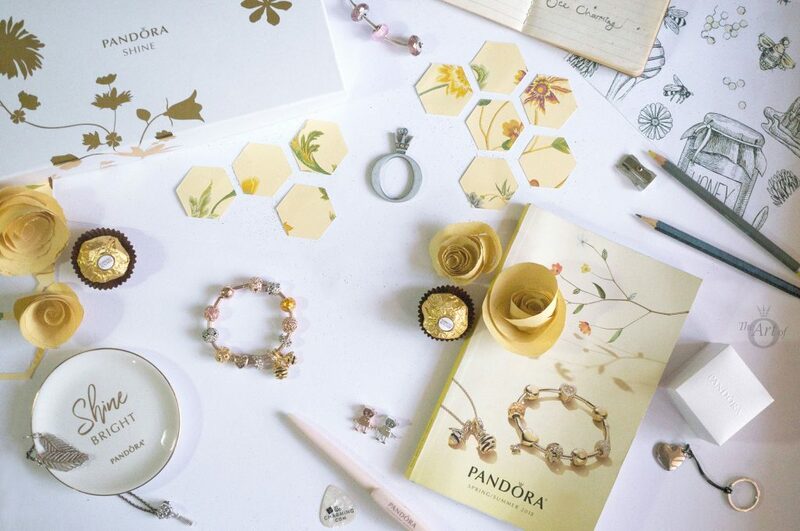 There is also a gorgeous limited edition bracelet which I have my eye on – the PANDORA Honeybee Bracelet! Thank you for commenting and have a wonderful day!